...of course it must be darker, that's what sells! The first of this series was a smashing success because they were wise enough to know what we love and cherish about this series. Once again, they allow each character to do his or her familiar "thing." We even get to see a Tribble! We have J.J. Abrams ("Star Trek" 2009) back at the helm, along with the same "Star Trek" (2009) writers, so we instantly know we are in capable hands. I'm not going to go into the plot because that isn't why we go to these things. Suffice it to say, there are some very bad guys and there is a lot of blowie uppie stuff! * Chris Pine ("Bottle Shock") is Kirk, still breaking rules and going by gut rather than regulations. He even breaks the "Prime Directive," for which Spock rats him out! * Karl Urban ("RED") his crusty Bones delights us, so when he unleashes his hot-tempered tongue, the audience just sits there with big grins... "Dammit Jim!" * Simon Pegg ("Mission Impossible: Ghost Protocol") is the perfect Scotty, so when he quits his post, Captain Kirk isn't the only one in shock! * John Cho ("Identity Thief") treats Sulu with the respect that role deserves, AND the Captain's chair looks good on him! * Anton Yelchin ("Star Trek") is wonderfully indecipherable as Chekov, his frantic attempts to restore power in Scotty's absence is one for the books! * Zoe Saldana ("Columbiana") makes a delicious Uhura, as we watch her juggle her duty to the ship and her affection for Spock. She also speaks Klingon, don't forget! 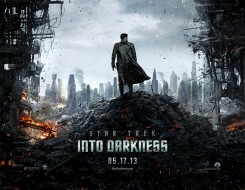 * Benedict Cumberbatch ("War Horse") is a new face to the series, his Khan is awesome. And in the fight scenes, he always wears that long overcoat so we can tell the fighters apart. Of course it's great to see the gang; I've only identified the main ones. There are many other major characters I haven't covered. Because I haven't included ONE SPOILER, you'll just have to go see it; I know you'll enjoy it. You'll see lots of humor, lots of action and lots of well-loved faces. By the way, I highly recommend all of the above films that I cite in BOLD. It's fun to be able to do that occasionally!